Posted by Christopher Donohue in History of the Human Sciences. One of my consistent complaints about our understanding of nineteenth century social theory in the United States is that there is little sustained efforts on these topics due to the problem of relevance. My contention was (now some years ago in “The Nineteenth Century Problem“) that our understanding of nineteenth century American intellectual history (as very narrowly defined by the history of ideas, so as to not include the history of social movements or ideologies) was hampered by the issue of relevance. We have a basic problem of knowing so little about nineteenth century social theory that we must resort to boot-strapping mechanisms. Thus, historians of ideas and historians of science would like to think that they can study anything they’d like. But this is simply not true. I am discussing this since many issues were addressed with my Zilsel friends last week. One was the issue of justification of case studies and of topics for analysis. My respondent (the extremely smart and gracious Volny Fages , who throughout put up with my bad manners) questioned why I justified my attention to the pseudosciences and even my choice of case studies. Posted by Will Thomas in EWP Primer. Throughout the 19th century, the nature of social changes and regularities in social activity remained an intense concern as population growth, urbanization, industrialization, and political upheaval captured the attention of scientific and political thinkers throughout Europe and America. As today, this thought necessarily spanned political, popular, philosophical, and scientific realms of thought as debates ensued concerning what could be said about societies and what could and should be done to affect how they function. In the early 19th century, keeping and deploying statistics was already widespread, but their use as a tool of political discourse remained novel, and thus a subject of general and heated discussion. 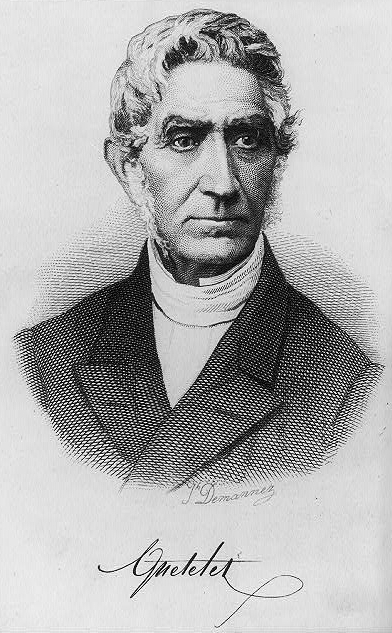 The astronomer and essayist Adolphe Quetelet proved to be one of the century’s most singular and influential thinkers concerning the use of social statistics. Born in Belgium in 1796 shortly after French annexed Austria’s Belgian provinces in the wars following the Revolution, Quetelet was educated in a French lycée, and as a youth took notice of the place accorded to the sciences in the Napoleonic empire. After Napoleon’s fall in 1815, Quetelet taught mathematics in Ghent, earned a doctorate in the subject, and, after convincing the government to build an observatory in Brussels, he departed to Paris—still the intellectual center of the world—to learn astronomy. Quetelet took up his post as director of the new Brussels Observatory in 1828, and the observatory began operation in 1832.